Bonide Japanese Beetle Killer, RTU, 32 oz. 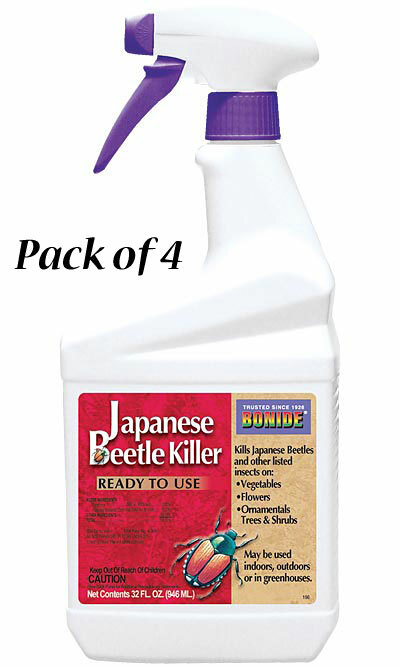 Eliminate Japanese Beetles on your vegetable plants and trees with Bonide Japanese Beetle Killer. This ready to spray treatment will control Japanese Beetles and other insects such as aphids, cabbageworms, diamondback moth larvae, and stink bugs on roses, vegetable gardens, flower gardens, ornamental plants, trees, and shrubs. Treat as soon as insects appear and repeat application every seven days, or as necessary, to maintain control. This insecticide may be applied up to the day of harvest and may be used indoors, outdoors, and on greenhouse plants. This treatment may be applied throughout the growing season or as a pre-harvest treatment when other insecticides are prohibited due to residue restrictions and use limitations. Prevent Japanese Beetles and other insects from damaging your plants and vegetables with this Japanese Beetle Killer. Made in the USA. Availability: 8 in Stock. Ships from OH within 24 business hours , 8 available at this price!